Samsung yesterday showed us what it's been secretly working on in the past few months. The answer is finished in glass and metal - the Galaxy S6 is undoubtedly one of the most exciting Samsung smartphones ever. Naturally, it has our full attention. Imagine our impatience as headed to Samsung's demo area, stumbling over the steps as we were eager to put the new Samsung flagship against Motorola's current champion, the Moto X (2014), because why not? 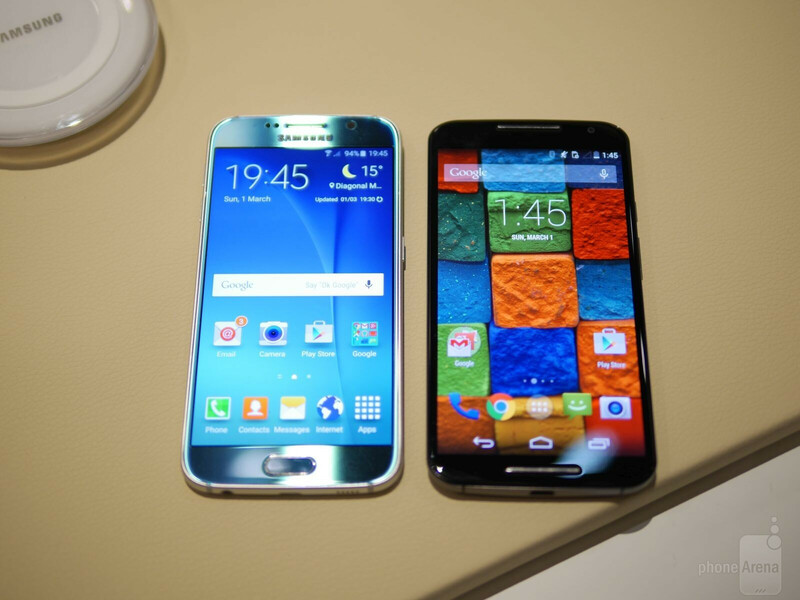 Speaking of exterior design, the Galaxy S6 and the Moto X can't be any different. There is a predominantly plastic device in this hands-on, and interestingly enough, it's not the Samsung Galaxy S6! Oh, yes, say what you want about the flagship, but is't certainly a pretty stylish and premium-feeling device. 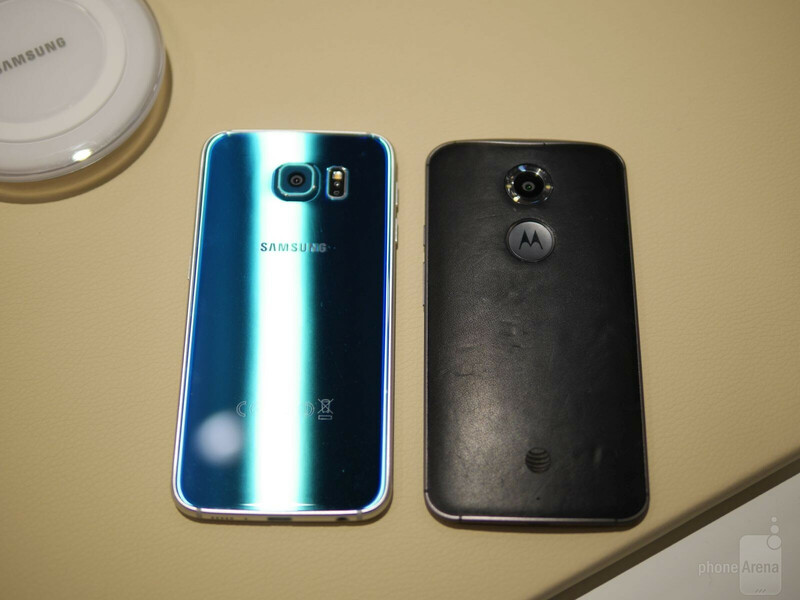 In the meantime, the Moto X is a also relying on aluminum in its build (for the frame), but it's mostly making use of plastic, mostly at the rear, but we should not forget that we can customize the Moto X with leather or wood back, giving it that unique premium feel, which puts it in the league of the new Galaxy. 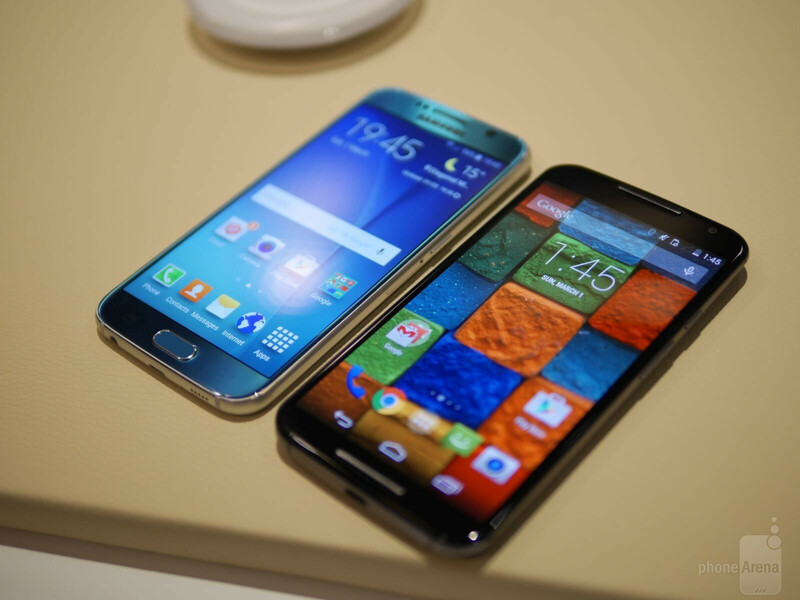 A stunning 5.1-inch, Quad HD Super AMOLED display is what you'd find on the Galaxy S6, while the Moto X (2014) is equipped with a slightly larger, 5.2-inch 1080p one, also using an AMOLED tech. As far as pixel density is concerned, we are dealing with a staggering 577ppi sharpness on the S6 and a noticeably lower density of 423ppi on the Moto X (2014). The difference is not stellar, but it's obvious - Motorola's flagship is totally not equipped with a bad display, but it can hold zero water to the Galaxy S6, which is inhabiting a league of its own. Sharpness is not everything, mind you - we are yet to put the Galaxy S6's display to the test, but at first look, we can say that Samsung has probably once again outdone itself and developed an AMOLED display with pretty respectable quality properties. We are assuming that the Galaxy S6 is coming with Samsung's latest Exynos chipset, though there's been no official word on this, so have one in mind. Alas, we know that the SoC is a 64-bit octa-core one, based on 14nm FinFET process, making it way more efficient than most of its rivals. Everything about the Moto X (2014), on the other hand, is known for some time - inside, you'll find Snapdragon 801 SoC churning gears at 2.5GHz. It's coupled with 2GB of RAM, but the Galaxy S6 is the clear winner in this segment, as it packs not 2, but 3GB of RAM, paving the way for batter multitasking. As we already claimed in our hands-on of the Galaxy S6, it's tough to say whether it's the best iteration of TouchWiz ever, though it certainly feels faster and way more polished than its progenitors. In Motorola's camp, we have a simplified experience is something we absolutely get from the stock Android running in the new Moto X. It’s a stark contrast to the features-rich experience of Sammy’s TouchWiz UI, since Motorola doesn't try to overwhelm us with software features. Samsung is following suit - TouchWiz, now based on Android Lollipop, is still the good old feature-packed UI that we're used to, yet dressed in a modern guise and streamlined for ease of use. 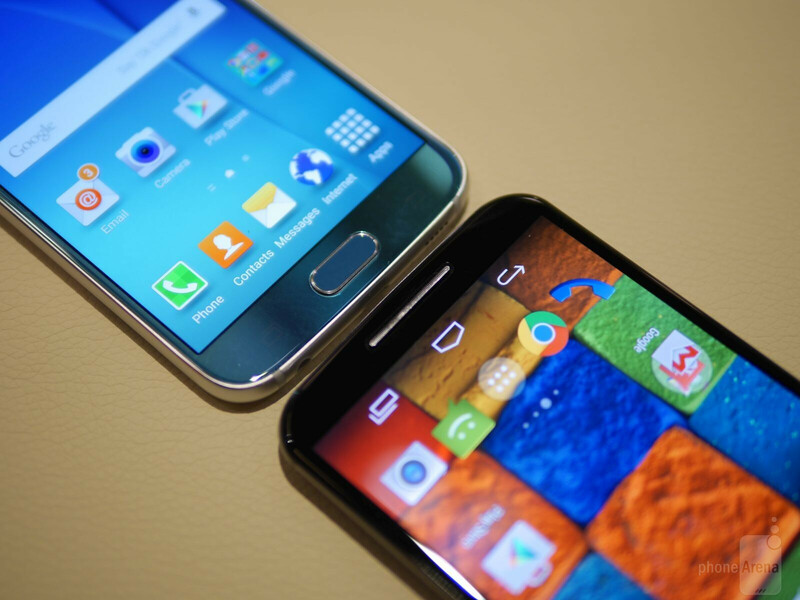 There is a slight, noticeable improvement over previous TouchWiz iterations. 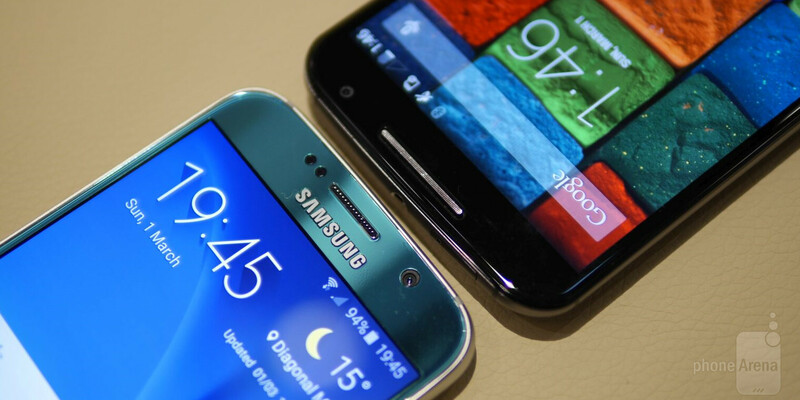 The Samsung Galaxy S6 has a 16MP rear camera, which is similar to the ones of the S5 and the Note 4, but there is a respectable host of new features involved. One of the more intriguing ones is the optical image stabilization aboard, in addition to real-time HDR, infrared white balance, and tracking auto-focus for the video camera. The Moto X comes with a 13MP shooter that boasts an aperture size of F/2.2, while the Galaxy S6 has an aperture size of F/1.9. We are yet to put the two cameras together, but are already suspecting that Samsung will be victorious in this segment, besting the Moto X 2014 in almost any photography-related contest we might devise. 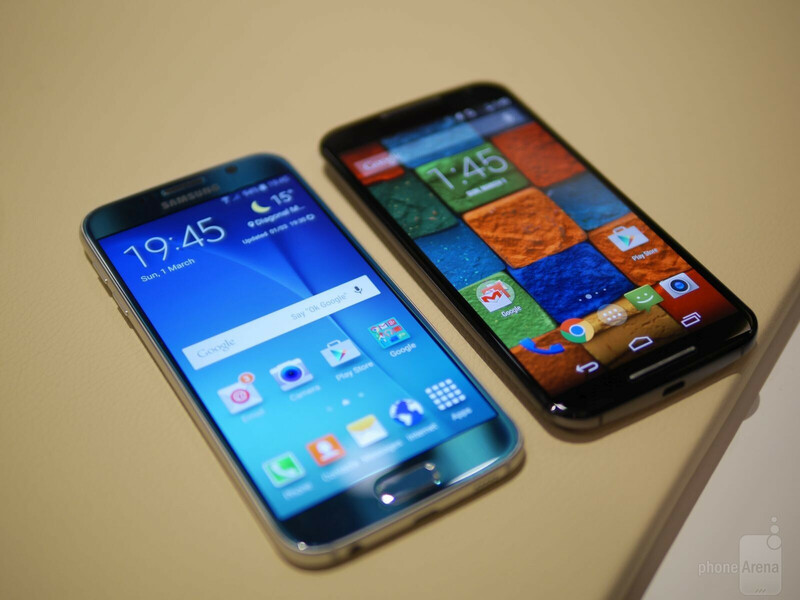 Seemingly, the Galaxy S6 feels like a superior device when put together to the Moto X, but that was a no-brainer. What's interesting is whether Motorola will successfully position the Moto X (2014) on the market, making it a viable and way more affordable device than Samsung's flagship for 2015. 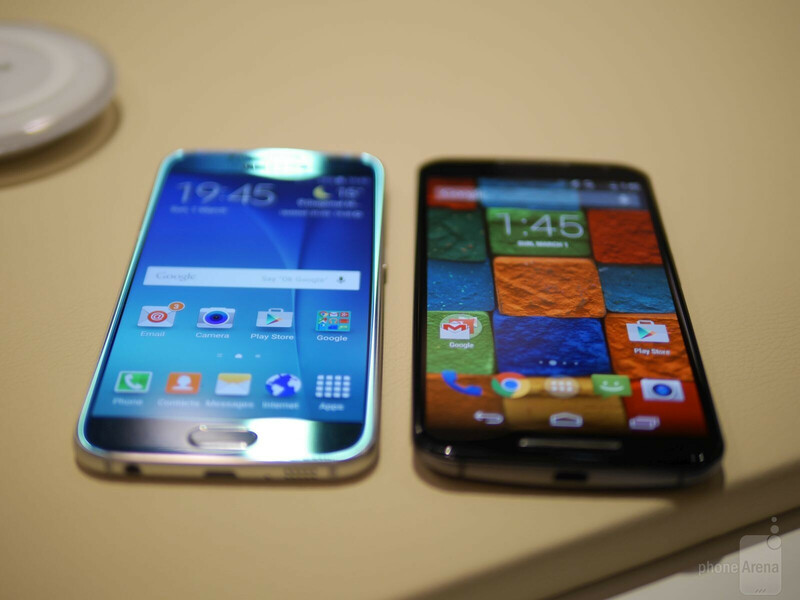 Even at the time of it's release, the quality of the Moto X was overshadowed. Right now, this is Motorolas only flagship offering to compare to Samsung. Not true. The droid turbo is the true flagship from Motorola. 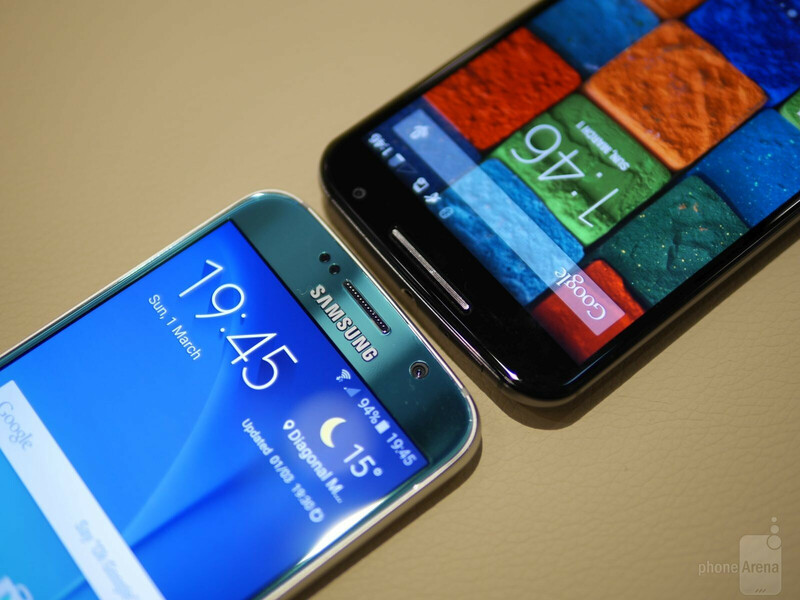 The Moto X does however have a lot of flagship qualities. Moto X in a nutshell? A slew of uncalibrated hardware with half baked software offerings that just made them "alright" in some regards. Could not disagree with you more. The hardware falls behind the S6, but that's to be expected for a phone that was released half a year before Samsung's next offering. Also aside from Motorola's other offerings, the Droid Turbo & Nexus 6, the Moto X (2014) still bench-marked better than any other Android Smartphone on the market. And the "Half baked software offerings" that Motorola put on the original Nexus would still prompt me to pick it over that phone over the new Galaxy. On a side note, my wife's Galaxy S4 has been giving her nothing but trouble since the day she got it, and she absolutely hates the brand now as a result. I love Samsung for the quality of their display technology, nothing else they've done really impresses me all that much and that's all there is to it.